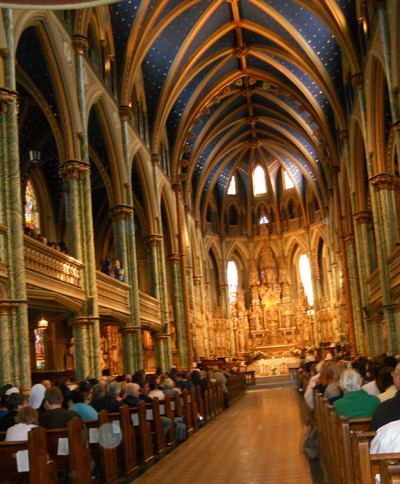 This week’s question: With which ministries/activities within your parish are you involved? 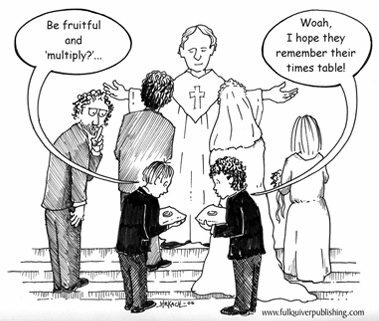 I am a lector at my parish, but my husband and I also teach Natural Family Planning and work on the marriage preparation team for the diocese. 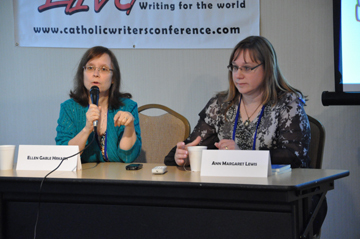 Are you a Catholic writer/author? 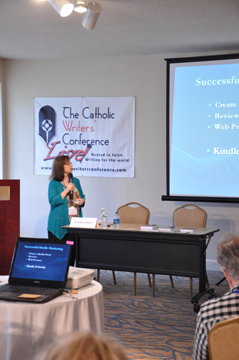 Check out the Catholic Writers Retreat that will be taking place in October in Michigan. 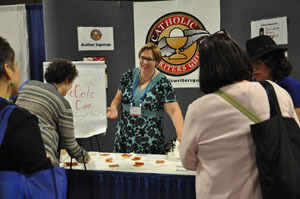 We had the opportunity to see this trailer (and the movie) at the Catholic Marketing Network Trade Show. Unfortunately, I didn’t actually get to see the movie, but I’m looking forward to seeing it soon. 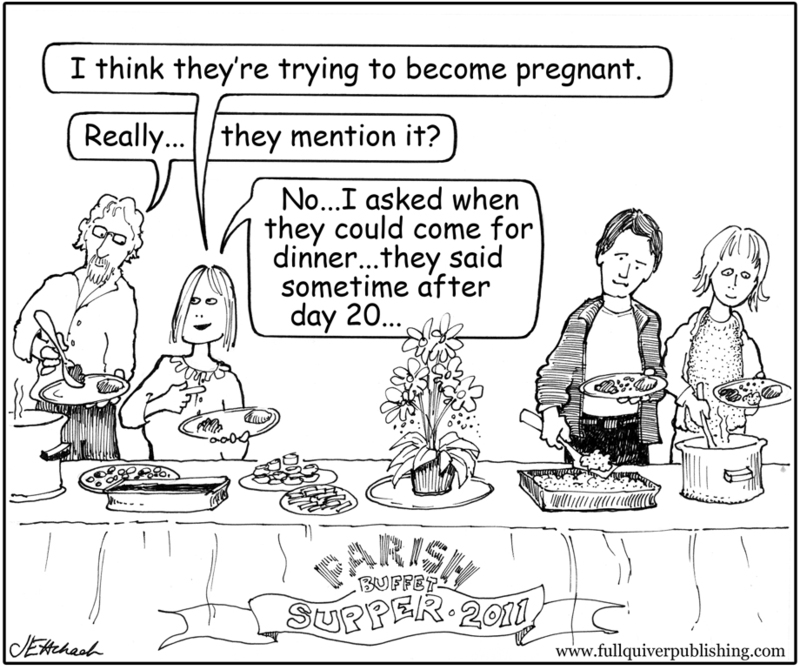 It has endorsements from many well-known Catholics! 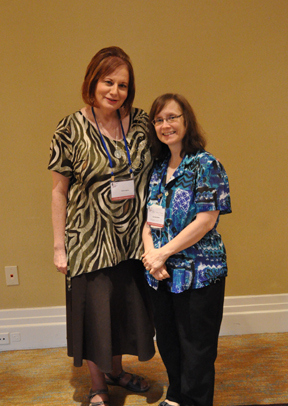 One of the huge advantages of attending the Catholic Writers Conference is the chance to meet online friends. 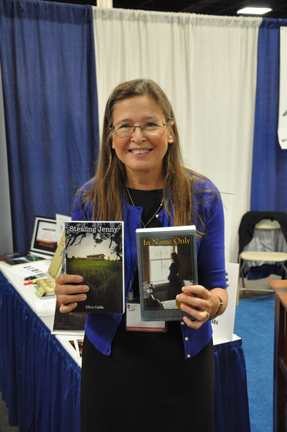 Jean has been a wonderful online friend since 2006 when she kindly reviewed my first book. My sister took this photo of me recently on our trip to Margate, NJ. 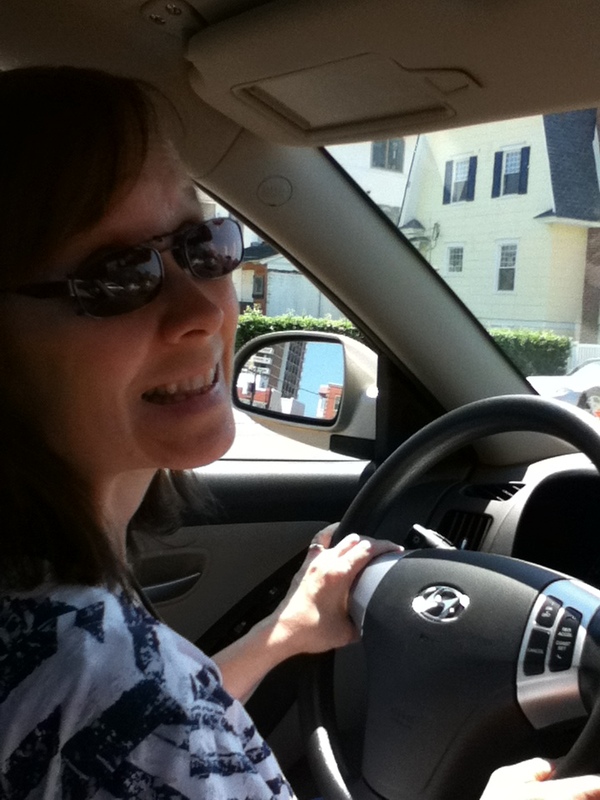 We were stopped at a light lest you think I was posing while I should have been driving! Come away for a time in the beautiful autumn of Michigan. Do you need time to flesh out a book? Working on a current manuscript that needs to be completed? Do you want to redefine your writing style, expand or find new avenues to express God’s way in your work, or simply need time away to center yourself as a writer? The Catholic Writers Guild is sponsoring Your Word is my Delight; A Catholic Writers Retreat, October 13-17, 2013 at St. Francis Retreat Center in DeWitt, Michigan. Because of a generous grant from a private donor, we are able to offer our retreat at half the price of most writing retreats–$450 includes food and lodging for five days in a modern facility. This retreat offers you time to write…a lot of time. Your days are open for you to do as you wish. You can walk the 95 acre site, write in the privacy of your room, go to Reconciliation and attend daily Mass and Adoration. 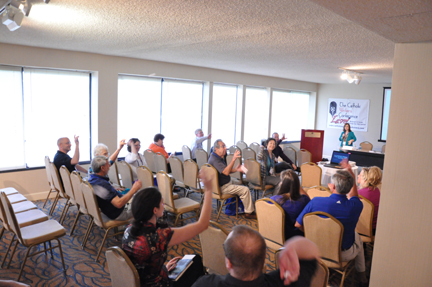 There is a library on-site for research, and a daily speaker on the topic of content evangelization. There will also be an opportunity for you to schedule an appointment to pitch your book with Lansing-based publisher, FAITH Catholic. It is a season for drawing dawn into the autumn of the year, to settle into a slower pace and write. Come and find your voice. 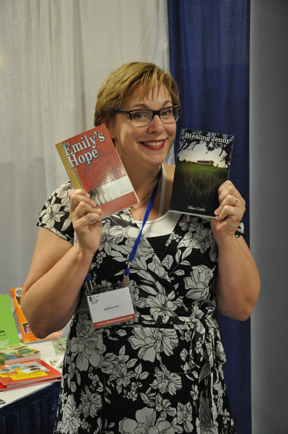 Special thanks to Laura Pearl, author of “Finding Grace,” for giving this photo endorsement of my books, In Name Only and Stealing Jenny! For more Snippets, click on the link to RAnn’s place above. Friday is here again (where did the week go?) and it’s time for 7 Quick Takes. 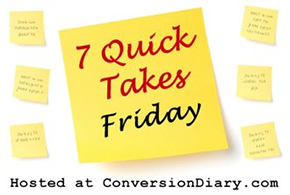 Check out more fun Quick Takes at Conversion Diary. My presentation on “Successful Kindle Marketing” went well and the attendees even participated in a game called “Snowstorm” (second photo below). 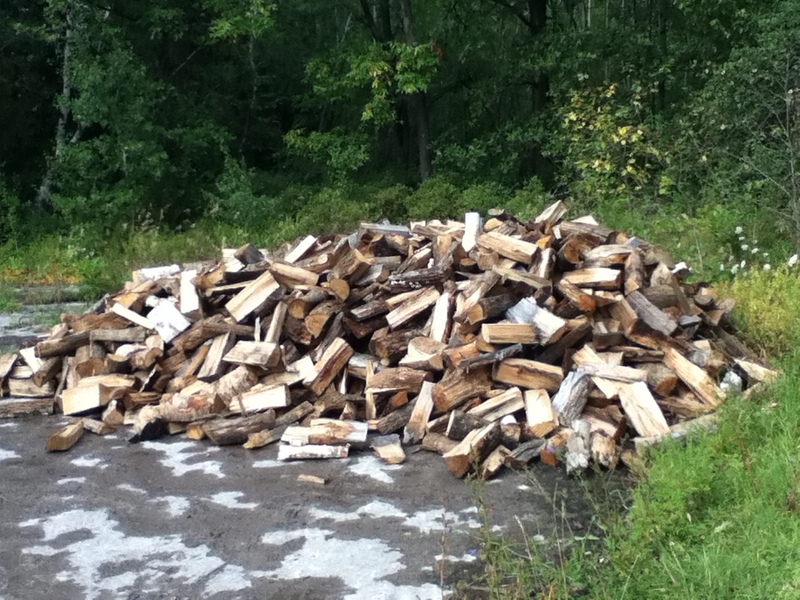 Just received our yearly delivery of logs for the winter. 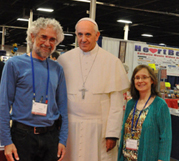 At the Catholic Writers Conference/CMN Trade Show a few weeks ago, we posed with the best cardboard cut out of the Holy Father that I’ve ever seen. Even standing in front of this double of the Pope, and knowing it was merely a cardboard cut out, we were amazed at how lifelike it was!